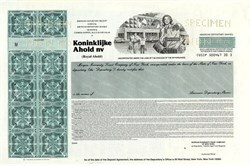 Beautiful engraved specimen certificate from the Koninklijke Ahold nv. This historic document was printed by Northern Banknote Company and has an ornate border around it with a vignette of a family leaving a grocery store. Dutch supermarket group Ahold is the world's third-largest retailer that stunned financial markets last month when it disclosed a $500 million overstatement of profits at its U.S. Foodservice unit. Ahold, the world's number three retailer rocked by an accounting scandal, will erase $30 billion in reported sales when it corrects the way it accounts for joint ventures. In the United States, Ahold has food retail, foodservice and e-commerce activities. Ahold operates over 1,600 stores grouped in six retail operating companies along the eastern seaboard under the regional brand names of Stop & Shop, Giant (Carlisle), Giant (Landover), Tops, BI-LO and Bruno's. Ahold's wholly owned subsidiary U.S. Foodservice, the second largest foodservice distributor in the U.S., can potentially meet the foodservice needs of approximately 95% of the American population. Ahold also operates Peapod, a leading U.S. internet grocer. In Europe, Ahold operates close to 7,000 stores in 13 countries. In the Netherlands, Ahold operates over 2,300 stores, including supermarket leader Albert Heijn and specialty stores Gall & Gall, Etos, De Tuinen and Jamin. Together with Deli XL, Ahold's wholly owned foodservice operator in the Netherlands and Belgium, these companies also operate the joint internet-based home delivery service Albert. Ahold holds a 73% interest in Schuitema, a wholesale supplier to the affiliated C1000 supermarket operators. In Northern Europe, Ahold has a 50/50 joint venture comprising almost 3,000 stores with the ICA Group, Scandinavia's largest food retailer, in Sweden, Norway, Denmark, Latvia, Lithuania and Estonia. Ahold also has foodservice activities in Sweden through the jointly owned ICA Menyf�retagen. 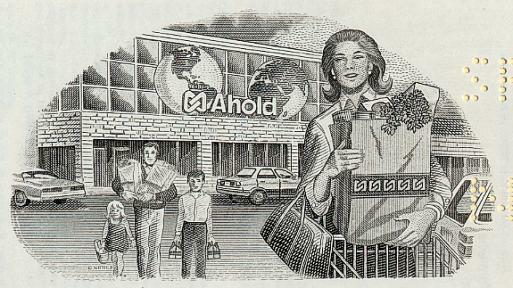 In Southern and Central Europe, Ahold operates over 1,150 stores. In Spain, Ahold operates over 620 Supersol supermarkets and Hipersol hypermarkets on the Spanish mainland, and Hiperdino hypermarkets on the Canary Islands. In Portugal, Ahold co-owns approximately 200 Pingo Doce supermarkets and Feira Nova hypermarkets. In Poland, Ahold owns over 165 Albert supermarkets and Hypernova hypermarkets. In the Czech Republic, Ahold owns more than 200 Albert supermarkets and Hypernova hypermarkets. Operations under the Hypernova banner in neighboring Slovakia were started at the end of 2001. In Latin America, Ahold is active in 10 countries with approximately 750 stores. In Brazil, Ahold is the owner of Bompre�o, the leading food retailer in the northeast of the country with over 100 supermarkets and hypermarkets, and G. Barbosa, a chain of 32 hypermarkets and supermarkets in northeastern Brazil. In Argentina, Ahold owns more than 235 Disco supermarkets, and in Chile, Peru and Paraguay operates more than 110 Santa Isabel supermarkets. In Central America, Ahold has a joint venture, named CARHCO, with La Fragua and CSU which operates more than 275 stores in Guatemala, Costa Rica, Honduras, El Salvador and Nicaragua. In Asia, Ahold is developing the TOPS supermarket format in Thailand, Malaysia and Indonesia with almost 100 supermarkets.